For many, installing solar is a great decision, and now it’s an easy, affordable option for homeowners. Like any home improvement project, doing your research can be a daunting task, but it doesn’t have to be. 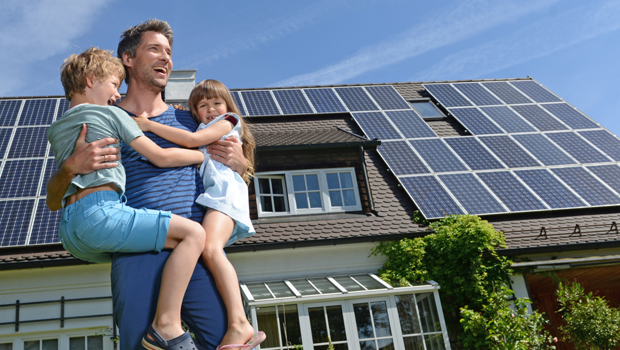 Deciding whether your home is a good fit for solar is something that’s easy to figure out. You will just have to take a look at your home and your home’s energy usage. First let’s talk about your roof. Because the size of your system is limited by available roof space, the roof matters. 1- For maximizing solar energy production, it is best if your roof faces south or west. The consistent rule-of-thumb is that the more south facing the surface, the more energy the system will produce. While those are best, your exposure might work just fine so don’t get discouraged. 2- Your roof must also be in good shape in order for solar panels to be installed. How your roof is structured also matters. An open, flat roof can accommodate panels better than complex, angled ones. The more clear space, the better. 3- It probably goes without saying, but your roof needs to get plenty of sunshine. A roof that is free from a lot of shading by tall trees or buildings is best for solar. If you do have shading from trees, would you be open to trimming trees back to allow more sun to shine through? Now it’s time to take a look at your current utility bill. Solar makes sense for homeowners when they are already racking up a lot of electricity usage on a monthly basis. On average, if you are spending about $100 or more per month on your overall utility bill, solar might be a good solution for your home. Next, let’s talk about the cost. How much a home improvement project costs always plays an important role in deciding if you can afford to start and complete the project. In the past, the only way to go solar was to pay the full cost of panels upfront, which can be a substantial amount. Today, there are financing and leasing programs available to you which make it simple to make the switch to solar for as little as $0 down. You can also choose an option where the solar company continues to own the solar panels and you purchase electricity based on what the panels produce. Most solar companies also include production guarantees and maintenance as part of their overall package to the homeowner. Now, that is a lot of value. Hopefully you feel more confident now understanding if solar is a good choice for your home and if it is, you’re ready to take the first step in talking with a solar expert. To learn more, click here.